Sensei is a smasher from Northern New Jersey now residing in California. He enjoys playing Super Smash Bros. as well as Super Smash Bros. Melee. He is also a member of The Smash Affiliates. 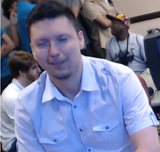 He can use all the characters in Smash 64 proficiently but prefers to use Pikachu and Fox for tournament play. In Melee, he uses Falco as his primary character. He was considered one of the best Smash 64 players from 2005-2013 and ranked 8th on the unfinished Smash 64 ELO Rating. Sensei still plays Smash 64 and participates at tournaments, though he is now mostly seen sandbagging and not prioritizing winning. This page was last edited on January 13, 2018, at 05:59.